We all want to feel cared for and valued by the significant people in our world. Students are no different. 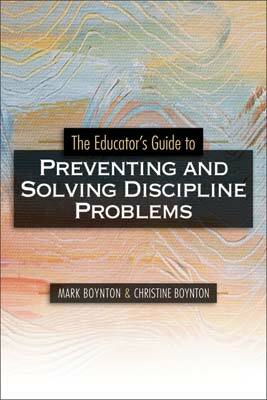 This knowledge is a powerful tool in the arsenal available to you as you form your classroom discipline plan. As a classroom teacher, you wield a great deal of power over your students simply due to the fact that you control their destiny for up to six and a half hours each day, five days a week. When students feel that you value and care for them as individuals, they are more willing to comply with your wishes. Think about it for just a minute. Aren't you more apt to go out of your way to please a boss who you feel values you as an individual and treats you with dignity and respect, rather than a boss who communicates a lack of respect for you? When your boss asks about your family, gives you “slack” when there is a personal emergency, or praises you for work well done, don't you develop feelings of regard for this boss and want to do your best to please him or her? Students have the same feelings. So it makes sense that developing positive teacher-student relations is one of the most effective steps you can take to establish a positive discipline climate in the classroom. It's critical to remember that when you treat students with respect, they tend to appreciate and like you. When they appreciate and like you, they are more willing to want to please you—which causes them to be more likely to behave appropriately. This is why it is so important to remember that, when it comes to student behavior, it's far more often the relationship students have with you than it is the rules themselves that encourages students to follow those rules. A review of the research shows that authors have a lot to say about positive relationships with students. Thompson (1998) says, “The most powerful weapon available to secondary teachers who want to foster a favorable learning climate is a positive relationship with our students” (p. 6). Canter and Canter (1997) make the statement that we all can recall classes in which we did not try very hard because we didn't like our teachers. This should remind us how important it is to have strong, positive relationships with our students. Kohn (1996) goes a step further, saying, “Children are more likely to be respectful when important adults in their lives respect them. They are more likely to care about others if they know they are cared about” (p. 111). Marzano (2003) states that students will resist rules and procedures along with the consequent disciplinary actions if the foundation of a good relationship is lacking. He goes on to assert that relationships are perhaps more important at the elementary and junior high levels than at the high school level. And according to Zehm and Kottler (1993), students will never trust us or open themselves up to hear what we have to say unless they sense that we value and respect them. As we showed in Figure S1, strategies to develop positive teacher-student relations should be the largest portion of your discipline plan. What are some strategies that you can implement to develop strong and powerful relationships with your students? Let's look at some techniques that are easy to integrate into your everyday interactions with students: communicating positive expectations, correcting students in a constructive way, developing positive classroom pride, demonstrating caring, and preventing and reducing your own frustration and stress. Research on teacher expectations and student achievement has shown that expectations have a dramatic impact on student academic performance (Kerman, Kimball, & Martin, 1980). Student behavioral performance is also dependent to a large degree on the expectations of significant adults in students' lives. Numerous studies indicate that the expectations teachers have for students tend to become self-fulfilling prophesies. It is therefore critically important for educators to monitor their interactions with the goal of communicating appropriately high behavioral and academic expectations to all students, not just to high achievers. There are several techniques that can be used to achieve this goal. Monitor the way you call on students. Make sure that you give all students chances to participate in class. Try to increase the amount of time you wait between asking a student a question and moving on by either answering the question yourself or calling on another student. Give students hints and clues to help them succeed in class. Tell students directly that you believe that they have the ability to do well. Your belief in them will inspire their success. Let's look at some of these techniques for communicating high expectations in more detail and discuss ways to implement these techniques in your classroom. When you call on students, there are several things to keep in mind. First of all, you must monitor the equitability of response opportunities. Often, teachers who keep track discover that they call on a small number of students frequently and allow few, if any, chances for students for whom they have low expectations to answer. When you fail to recognize particular students, you can communicate a low level of confidence in their abilities. Individual students may “tune out” and believe that you don't expect they will be able to answer your questions. This message is compounded when these students see others being called on regularly. Think about what it would communicate to you if your boss always asked other teachers to participate in committee work or special projects instead of you. And how would you feel if the boss continually came to you for help on curriculum projects or input on difficult students? Just as we do, students develop feelings of self-confidence in their abilities when their teacher goes to them for the right answer. In addition, calling on all the students in your class—rather than a select few—will help keep students on task and decrease the number of behavior problems. It is important that you monitor yourself to be certain that you are providing all of your students with response opportunities. Putting a check by the name of each student you call on during class discussions is an excellent way to quickly determine whether you are being equitable. Also, you should monitor yourself to make certain you are not calling exclusively on your high-achieving students but also on students who have a pattern of not performing well. Keeping a simple checklist on a clipboard during classroom discussions is a great strategy you can easily implement. Figure 1.1 is an example of such a checklist. In this example, you can see that Donna and Sam are getting the majority of the response opportunities. This could be because the teacher has confidence in these students, knows that calling on them will keep the discussion moving, and wants the other students to hear the correct answers. However, it also could lead the other students to think that the teacher doesn't have confidence in them and doesn't expect them to participate, and it increases the likelihood that they will get off task. If you were the teacher, you would want to be sure that before the end of the discussion you called on all your students so as to make the discussion more equitable. Try to make an effort to call on students who have typically been off task or who have been achieving at a low level, allowing them to respond and participate in class, and watch what happens. Over time, you will notice that these students will remain on task more often and improve academically! This change does not occur immediately, but it definitely does occur and is extremely gratifying to see. Increasing latency (Kerman et al., 1980) is another technique you can use to communicate that you have positive expectations for a student. Latency is the amount of time that elapses between the moment you give a student a response opportunity and the moment you terminate the response opportunity. Kerman and colleagues (1980) explain that the amount of time we give to students to answer questions is directly related to the level of expectation we have for them. We give more time to students when we have confidence in their ability to answer a question. Conversely, we give less time to students in whom we have little confidence. When you quickly give up on a student who is struggling with a response, it is clear to everyone in the classroom that you don't expect him or her to come up with the right answer. In addition, when you give up on a student who initially struggles with a response, the student realizes that all he or she needs to do to “get off the hook” is respond to your question with a confused expression or blank stare. What you will find when you make a conscious effort to extend the length of latency you allow for low-achieving students is that these students will begin to pay more attention, become more actively involved in discussions, and minimize their behavior issues. One thing you can do is ask a teaching peer to observe your instruction and chart the length of the latency periods you are giving each student from the time you ask the question until you move on to another student. It is especially interesting to find out which students get longer latency periods from you. Figure 1.2 shows an example of a latency chart. In analyzing the chart, it is easy to see that Donna and Mary are consistently given more latency and, therefore, more chances to give a correct response than are the other students. If this were your classroom, you could try to make sure that in future discussions and question-and-answer periods you give longer latency periods to other students as well before moving on. You also communicate positive expectations by giving hints and clues to your students. In their work on teacher expectations, Kerman and colleagues (1980) point out that teachers usually do more “delving and rephrasing” for students for whom they have high expectations and less for students for whom they have low expectations. It is important that we communicate to all our students that we have high expectations for their success, and one way to do this is by giving more hints and clues to all students, especially the low-performing students. There are things to be cautious about when using this technique. If you provide too many hints and clues, you may actually give the student the answer. Also, after a number of hints, it may be that the only student who doesn't know the answer is the one being called on, which ends up being an embarrassing experience. The important point, however, is to use hints and clues with all students to communicate that you have high expectations for the entire class. This helps build positive teacher-student relations. Another way to communicate positive expectations to students is by directly telling them they have the ability to do well. When you tell your students you have confidence that they can handle a difficult assignment or improve their behavior, you impart a very powerful message. Students often will work hard and behave appropriately to prove that your confidence in them is justified. Every child needs to have at least one significant adult in his or her life who believes that he or she can do well. Ideally, children would hear this from their parents, but the sad truth is that is not always the case. Teachers have the unique opportunity and privilege to communicate daily to a number of students that they believe in them. What a gift to be able to be that significant adult in even one student's life. Using this strategy might lead a teacher to say this to a student: “Emma, I know you'll do your best on this math test. You've been working very hard on remembering to write down your thinking as you solve math problems, and I know you can transfer that skill to this test. I'll check back with you later.” This approach can be modified for any grade level or subject area. Once again, this is a positive relations strategy as well as an instructional strategy. You can also let students know that you have positive expectations for them by referring to past successes (Kerman et al., 1980). When you tell a student that you know he will behave appropriately at recess because he was successful yesterday, you help build confidence in the student and increase his chance for success. And after a student demonstrates good behavior or academic achievement in a specific situation, telling her you knew she would be successful (Kerman et al., 1980) also instills confidence and a culture of positive expectations. Students need to know that their teachers respect them and have confidence in them. Using these different strategies to consistently communicate your positive expectations will work wonders. We challenge you to begin using one or two of these strategies today to build high expectations and positive teacher-student relations. Correcting and disciplining students for inappropriate behaviors is a necessary and important part of every teacher's job. However, it doesn't have to be a negative part of your job. In fact, you can actually build positive relationships when you correct students. If you don't believe this, think for just a minute about students you have had in the past who came back to school to visit you. Often it is the students who were the most challenging and with whom you had to spend the most time who continue to visit you over the years. This is due to the positive relationships you developed with them. The goal in correcting students should be to have them reflect on what they did, be sorry that they disappointed you, and make a better choice in the future. It should not be that they go away thinking, “I hate my teacher. I'm going to be sure I don't get caught next time.” The difference in students' reactions to being disciplined is often related to the manner in which you correct them. If you allow students to keep their dignity, you increase the chance that they will reflect on their behavior and choose their behaviors more wisely in the future. The correction process will be counterproductive if students are corrected in a manner that communicates bitterness, sarcasm, low expectations, or disgust. The goal is to provide a quick, fair, and meaningful consequence while at the same time communicating that you care for and respect the student. Figure 1.3 outlines steps to be taken when correcting or disciplining a student. Review what happened. Discuss the incident with Johnny. Begin with fact finding to be sure that you are appropriately correcting the student. The worst way to affect teacher-student relationships is to unfairly discipline a student. Identify and accept the student's feelings. Tell Johnny that you understand why it upset him to hear somebody call his mother a name and that you, too, would be upset if someone maligned your mother. It's important to understand that this step communicates that you respect and understand his feelings but that you are not accepting his actions. Review alternative actions. Go over with Johnny the different actions he could have taken, such as ignoring the remark or reporting it to a teacher. Explain the building policy as it applies to the situation. Remind Johnny of the building policy of not fighting and that the rule is if anyone hits another student, he or she will be sent to the office and possibly be suspended from school. Let the student know that all students are treated the same. Make sure that Johnny understands that all students must adhere to the policy and that any student who disregards the rule will suffer the consequences. Invoke an immediate and meaningful consequence. Communicate with the office about what happened and send Johnny to the office. Let the student know you are disappointed that you have to invoke a consequence to his or her action. Tell Johnny that you are disappointed that his actions have led to this situation. Communicate an expectation that the student will do better in the future. Remind Johnny that, although you do not approve of his actions and do not like to send him or any student to the office, you like him and know that he will make a better choice next time. Also tell him that you are there to support him and work through these issues with him in the future. In addition to your following these steps when correcting a student, it is important to keep some key philosophical precepts in mind. First of all, remember to correct the student in a private location. Although it is not always possible to remove a student from the classroom, do your best to prevent visual access by other students as you discipline. Public correction can foster feelings of anger, embarrassment, and bitterness; it can also become a sideshow for the other students. Also, when invoking a consequence, you should ask yourself, “How would I want my own children disciplined in a similar situation?” Answering this question will help you treat the student with care and respect. Finally, remember to stay calm and avoid frustration. The worst thing you can do is to invoke a consequence when you are angry or upset, as this can lead to regrettable actions on your part. If necessary, give yourself a “cooling-off period” before intervening with the student. Figure 1.4 reviews the key philosophical considerations for correcting students. It is also important to follow certain steps after disciplining a student. These steps are shown in Figure 1.5. Touch base with the student. Follow up with Johnny after the consequence, checking to see how he's doing and simply making contact with him. Acknowledge postdisciplinary successes. The next time Johnny has difficulty with a student and handles the situation more appropriately, such as by verbalizing his displeasure rather than using his fists, be sure to acknowledge his behavior and praise him for making the right choice. Don't give up too quickly. Finally, don't forget that some students respond negatively to positive attention. In such cases, it may appear that the student doesn't want the positive attention. What may actually be happening is a gradual change in the student's self-concept. When students are used to getting into trouble and having negative attention, it takes a while to break this cycle. Often it is just a matter of time before the student starts to show the positive effects of this attention, so don't give up! Remember: Students will recall how you made them feel long after they have forgotten the consequence they earned as a result of their actions. If applied effectively, pride can be an extremely powerful force in developing positive teacher-student relationships (Kerman et al., 1980). In many classrooms, students are proud of the fact that they are behaving and achieving at a high level. In other classrooms, a different type of pride develops when students see themselves as being the worst they can be. The pride students develop helps shape identities that in turn drive their behaviors. When you recognize student successes, there is a decreased likelihood of fostering negative pride and an increased likelihood of developing positive pride. As a classroom teacher, your goal should be to help students take pride in their accomplishments and positive behaviors rather than in their negative behaviors. Figure 1.6 lists some strategies that will help you attain this important goal. Positively reinforce students verbally on a regular basis. Tell your students when you are pleased by their behavior. Let them know that you're not surprised when they grasp a difficult concept. This is a powerful way of developing positive pride. Publicly asking other staff members to enter the classroom so that they can see a specific accomplishment of your class, such as the way they respond to your instructions, is an example of showing off the class's achievements. However, be careful to speak to the accomplishments of all the students when you use this strategy rather than to the accomplishments of just the top students, or the strategy could backfire on you. There are numerous opportunities to develop pride in all areas, such as by publicly recognizing high test scores, acts of kindness, positive citizenship, and athletic accomplishments. You can also extend the pride taken in the class by developing parental pride in student accomplishments. Provide opportunities for parents to review student work in newsletters, during back-to-school events, and at parent conferences. Let parents know about high attendance rates, high test scores, and the percentage of homework or assignments completed. In this way, you are enlisting parents to be your partners in fostering this powerful positive relationship tool. Remember that pride does not always have to involve only excellence. Pride in improvement is an important type of pride to nurture. Test scores and daily assignments that go from a D to a C and homework that starts coming in on time are examples of great opportunities for you to recognize student success and build pride. When Kelley, a new teacher, took over a 6th grade class at a large elementary school in January, he used a combination of these approaches to build pride in the students. The class had already “gotten rid of” two other teachers, and they were proud of being the “baddest” class in the school. Besides teaching clearly defined parameters for appropriate behaviors and strong consequences for negative behaviors, Kelley gradually worked at building positive pride with the class. While practicing walking in the hallways and transitioning between activities appropriately with the class, he would invite the principal or other teachers in and say, “I just wanted you to see what a great job my class is doing and how proud I am of the respectful and quiet way they are walking in the halls.” After working with the students on how he wanted them to respond when he gave his signal, he would again invite other staff into the room and say, “Look at how quickly and quietly my class responds to my signal. They have really improved. Aren't they great?” In addition, he would tell the students on a regular basis that he couldn't wait to get to school each day because it was so much fun working with them and because he was so proud of their improved behaviors and academics. This continued focus on building positive classroom pride gradually changed the pride the class had in their negative behaviors to pride in their new culture of positive behaviors. These are just some of the ways you can work to develop student pride individually and collectively. This in turn will help you build positive relationships with your students. A key element of Kelley's success was that he was sincere in his proclamations of pride in his students. Children are intuitive regarding sincerity, and insincere comments will quickly backfire. One caution for secondary teachers concerning pride involves a distinction between the manner in which you foster pride for different grade levels of students. What works for elementary and middle school students is not necessarily appropriate at the high school level. Sprick (1985) points out that it's more effective to use calm, quiet statements with secondary students than emotional praise, as they get embarrassed and don't like to be singled out from their peers. We believe you can and should instill positive pride with secondary students, but a more private method may be more effective. Demonstrating caring is one of the most powerful ways to build positive relationships with your students (Kerman et al., 1980). When your actions and words communicate that you sincerely care for your students, they are more likely to want to perform well for you and enjoy coming to school. Caring also fosters a preventive approach to discipline, as students who feel cared for are more likely to want to please you by complying with your wishes and policies. It is a tragedy when a student mistakenly believes that his teacher does not care for or like him. In most cases, teachers do care but fail to do the things that directly communicate this valuable message. Figure 1.7 lists some strategies to communicate to your students that you care about them. Standing by the door and welcoming students as they enter the classroom is a quick and easy way to show students they are important and that you are glad to see them. This procedure also helps you start the day with personal contact with each and every student. This is a procedure Wong and Wong (1998) advocate as a way to begin the day and the school year on a positive note. When you see students display strong emotions (e.g., when they are happy, excited, or angry), you have an opportunity to build positive relationships by asking how they are doing and what is going on with them. Statements such as, “Are you all right?” and “Can I help with anything?” let students know they are cared for, valued, and noticed. Listening intently and sincerely to students is a powerful way to communicate how much you care. Maintaining eye contact and paraphrasing helps students realize that you have heard them. In addition, when you empathize with students, they understand that they are recognized and valued. This does not mean that you have to agree with all their actions, but that you let them know that you recognize the emotions behind their actions. You can communicate empathy by telling students that even though it's wrong to hit someone, for instance, you understand the emotions behind an incident. These are just a few ways that you can demonstrate to your students that you care about them. As indicated earlier, you must never forget the power of caring. The bottom line is that caring helps build strong positive relationships that in turn help prevent discipline problems in the future. Frustration and stress, which are inevitable in the teaching profession, are the great enemies of our best intentions. Zehm and Kottler (1993) list some external causes of stress for teachers as difficult students, irate parents, and collegial backbiting. Frustration can have a devastating effect on teacher-student relationships, as it tends to cause educators to make irrational decisions. Usually you know when you are becoming frustrated and can quickly identify the signs and symptoms. As an educator, the question is not if you will become frustrated or stressed but when you will and howyou will deal with it. Signs of frustration or stress can include nervousness, anxiety, shortness of breath, and a tendency to make irrational decisions. First, you should be able to recognize your own personal signs that frustration or stress is building so that you can de-escalate them. You should then have a plan that will help you prevent or reduce frustration when it occurs. Your frustration prevention or reduction techniques will be unique and personal to you; what works for one teacher might not necessarily be effective for you. Figure 1.8 shows some typical frustration and stress prevention or reduction techniques that you can implement. Playing soft, relaxing music when feelings of frustration are approaching can have a beneficial effect for both you and your students. Some teachers proactively play soft music during independent study time. Displaying posters throughout the classroom of attractive destinations can help keep you calm. You might put up pictures of beautiful beaches, snowy mountains, green valleys, ski resorts, or tropical islands to give yourself—and your students—opportunities for mini mental vacations. Most teachers have certain lessons they truly enjoy teaching. When feelings of frustration or stress are approaching, try modifying your lesson plans and teaching a lesson that not only meets the student learning goals but also brings you pleasure. Sometimes just taking a short walk around the school can be relaxing and can head off feelings of stress or frustration. This can also help students relieve pent-up energy. For instance, there may even be a way to integrate the walk into your current curriculum by turning it into a nature walk or a service project (e.g., picking up litter). Difficult students can be a major cause of frustration. Allow yourself to ask for help by asking a neighboring teacher to take a difficult student for a short time. This strategy is one that you should set up ahead of time, making certain that your colleague is agreeable to this arrangement. Offering to do the same for the other teacher is a good way to begin using this strategy. Strategically assigning independent reading time to students is another way to calm the classroom down and provide you with a break when frustration raises its ugly head. For some teachers, one source of stress or frustration is a messy desk, submerged in various unfinished tasks. If you are one of these teachers, an easy way to decrease frustration is to clear off your desk and take time to organize your work area. Frustration and stress often disappear when a supervisor or peer lets you know they value and appreciate your work. Knowing which colleagues you should visit to help validate your work is another technique to use in lowering levels of frustration and stress. Sharing staff duties can help too, as frustration and stress often occur when a teacher feels overwhelmed and behind. You should let your colleagues know you are willing to cover some of their duties and also let them do the same for you. Also, sharing other ideas with teachers on frustration- and stress-reducing techniques is a way to increase your repertoire of strategies. Zehm and Kottler (1993) mention additional stress- and frustration-reduction strategies, such as maintaining a healthy lifestyle with good sleeping patterns, free of alcohol and drugs. They also advocate continued training and professional growth tasks, such as varying teaching assignments, taking a sabbatical, having a faculty exchange, engaging in team teaching, supervising a student teacher, going back to school, conducting field trips, leading research projects, writing grants, and instigating technology projects. In addition, they suggest keeping a journal as a reflective strategy to help deal with stress and frustration. In summary, there are many ways you can develop positive relationships with students in your daily interactions with them. Not only does this contribute to a positive classroom environment, but it also improves the quality of school life for both you and your students. While building positive relationships is the foundation to a strong discipline system, relationships alone are not enough. It is also critical to clearly define parameters of expected behaviors, to monitor those behaviors, and to implement consequences when necessary.